With these easy barbecue fish recipes you don't need to worry about flaking fish that disappears through the cooking grate and onto the charcoal. Here are my quick tips to prevent this happening. The first TIP - make sure your fish is fresh! It really does make all the difference. Whole fish should have bright eyes (not bloodshot), pink gills and shiny bodies. Filets, steaks and cutlets should not show any signs of dryness or discoloration nor should they be wet and shiny. All fresh fish should have a mild clean smell, if it has a strong smell, don't buy it. I'm lucky enough to live by the coast so fresh fish is a plenty and I also get some great advice. THE man who knows everything about fish from catching right through to cooking is my friend Manu (here on the right) who lives and works in Spain and has given me some great Spanish influences to my barbecue fish recipes. Use a Teflon® barbecue mat, this provides and non stick surface to place directly on your grill grate and then place the fish on the mat. 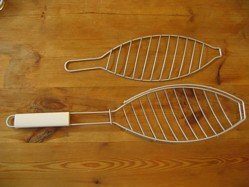 Use a fish basket (pictured below) These help you turn the fish in one smooth movement so reducing the risk of break up. In addition to the above equipment just let your fish cook gently and don't be tempted to turn it all the time. Use some oil. Brush you fish with oil before you start and this just helps lubricate proceedings and it makes all your equipment easier to clean at the end of the cookout. There are some tried and tested techniques for grilling fish such as wrapping in foil but at the end of the day anyone can do that and you don’t get that char grill sensation. You might as well just put your fish in the oven so this is one technique that I avoid. I like to make the bbq look interesting as well as smell interesting. If all you can see is a pile of foil wrapped fillets it takes the pleasure away. 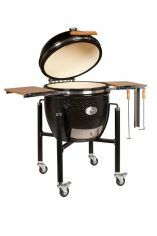 What could be simpler than stuffing the cavity to grill trout or salmon? I’ve included some variations on this theme in the barbecue fish recipes below. Indirect heat cooking method. It's very easy to over smoke fish so generally I reserve this cooking method for oily fish that has a naturally strong flavour. however I have some great hot (110°C (225°F)smoking recipes below too. With all these techniques the smoking stage is usually preceded by a brine curing step. A Native American style of cooking that I've also found alive and well in Finland. Indirect cooking on a piece of soaked wood (usually cedar or alder). There are plank cooked fish recipes below and you can use this link for the complete list of all my plank cooking recipes. A Grilled Fish Recipe For Any White Fish - The flavor secret is in the citrus and white wine marinade. Grilled Fish Tacos - White fish with fresh salsa all wrapped up in a flour tortilla. Barbecue Trout Recipes - Simply prepared and three different rubs for you to try. Barbeque Trout - wrapped in newspaper and steamed on the grill. Grilled Trout - with fennel oil and garlic. Stuffed Grilled Trout - Trout steaks infused with sun dried tomatoes and basil. Also works well with Salmon. Grilled Whole Salmon - With a salsa verde stuffing. Teriyaki Grilled Salmon - A 30 minute marinade gives wonderful flavor and vibrant colors too. Greek Style BBQ Fish - Essential eastern Mediterranean ingredients include olive oil, lemon juice and oregano. Barbecue Monkfish In Bacon - Firm succulent white fish wrapped in salty bacon, the perfect finger food to start your BBQ party. Citrus Stuffed Barbecue Monkfish - Easy to do and packed with your favorite citrus fruit juices. Barbecue Salmon Appetizer - Straight from the Canary Islands with Mojo sauce that packs a punch. 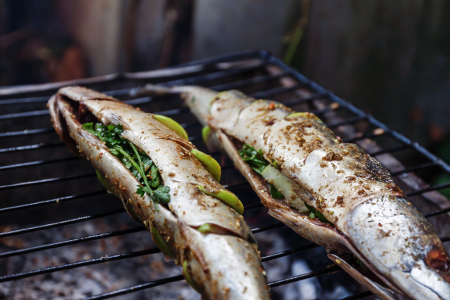 Barbecue Sardine Recipe - Simple fresh flavors just the way they do it in Portugal. Barbecue Sea Bass - Aniseed packs a punch here with fennel seeds and a final flambé in Pastis. Grilled Sole And Chili Lime Sauce - Do I need to say anymore? Barbecue Swordfish Kebab - This meaty fish is perfect for kebabs and there's a beautiful marinade to go with this recipe. BBQ Swordfish Steaks - No messin' here. A big garlic marinade and slap it on the grill. Grilled Tuna - Smothered in fresh basil and chili and just a quick flash either side for the perfect tuna dish. Grilled Tuna Steak Recipe - This time packed with the vibrant colors and flavors of lime, ginger and chili. Grilled Mackerel Salad - 30 minutes marinade, medium coals and you've got a mighty fine salad. Bacon Wrapped Fish - Gurnard tails, really meaty and the perfect size for these bacon wrapped goujons. Grilled Catfish Recipe - A really easy rub together with two tip tips for making sure that your catfish tastes fresh and not muddy. Hot Smoked Salmon - It's 24 hours in preparation but absolutely worth the wait. Arbroath Smokies - Deep in color and flavor. Now you can re-create this fine Scottish tradition. Hot Smoked Mackerel - Just look at the beautiful golden color. It tastes mighty fine too! Smoked Mackerel Salad - Smoke your own or use commercially smoked mackerel for this healthy meal in minutes. For "Plank Cooking" fish - Here are my latest recipes on this subject. Fish is an excellent source of protein whilst being low in fat and carbohydrate. White fish have a more delicate flavor than the brown oily fish. They have less than 2% fat and typically contain only 50-80 Calories per 100g or 4oz. Oily fish (such as herring or mackerel) generally have a darker brown flesh. Rich in Omega 3 fatty acids they have between 8-20% fat and contain between 80-160 Calories per 100g or 4oz. When it comes to diet and having oily fish for health reasons you can include Salmon and Tuna in this category. We humans are now eating more and more fish and this is putting pressure on the fishing industry and fish stocks in general. There is an ethical debate to be had, I don't know the complete arguments so I'm not going to make any sweeping statements about how we should source fish for the table but there's one thing that (to me) seems plain wrong. Only 50% of the fish caught in the world is destined for human consumption the rest is for animal and fish feed. A large proportion of the anchovies landed in South America are processed for fish feed and aside of the shipping costs / pollution to move this feed around the world did you know that it takes 1.4Kg of feed to produce 1Kg of farmed fish - that's just plain simple inefficient. Why not simply eat the wild fish in the first place? 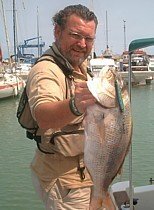 I choose wild fish for my easy barbecue fish recipes.